Since joining Western’s faculty in 1989, Angela Esterhammer has demonstrated excellence in research, teaching and service. After filling in last year as Acting Dean in the Faculty of Arts, Esterhammer is Associate Dean in the Faculty of Graduate Studies. She has been instrumental in building Comparative Literature as an interdisciplinary field of study at Western. “She served for several years as the first Graduate Chair of Comparative Literature, leading the development of course, program, examination, and thesis requirements, as well as publicity materials, and mentoring the first cohorts of students through the program,” says a nomination letter for Esterhammer. Esterhammer’s publication record includes 10 books (authored and edited) and approximately 45 single-authored articles in refereed publications in North America, Britain and Europe. She specializes in European Romanticism, literary theory, philosophy of language and the Bible. Her research examines the concept of poetic improvisation in Romantic and nineteenth-century culture. She received her Honours BA in English and Comparative Literature from the University of Toronto in 1983 and completed her PhD in Comparative Literature at Princeton University in 1989. 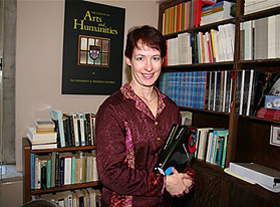 While completing her PhD dissertation at Princeton, she was chosen by Northrop Frye to receive the Toronto Arts Awards Foundation Protégé Award, and later was honoured with the John Charles Polanyi Prize for Literature. In 2002, she was recognized with the Hellmuth Prize, Western's highest honour for excellence in research. "On a personal level, I’m thrilled and honoured,” says Esterhammer of the Distinguished University Professorship award. “As a member of the Western community, I think the Distinguished Professor and Faculty Scholar program is an exciting initiative, one that will give us more opportunities to celebrate and promote the great work being done across campus. I especially appreciate how the award recognizes the diverse activities of teaching, research, and administration that are part of every faculty member’s life, in one way or another."